I was a big collector of rpgs in my youth. I had copies of tones of Gurps source books, Paranoia, Shadowrun, and other classics As I got older I bought less and less rpg material, and eventually I decided that role playing was a hobby that I didn't have time for anymore. It took too much time and energy to collect a group of players, read and understand the rules, and prepare material. About ten years ago I remember seeing the All Flesh Must be Eaten core book on Amazon. I thought that the book looked cool but I did not buy it because I felt that I would never be able to play something like that. I didn't have any friends at the time who knew what rpgs were and my wife wasn't interested in them. Heck, I gave my copy of Paranoia to Goodwill because I figured that I had no use for it (a decision I now regret). Later on I started doing some research on D&D on the internet. I figured out that D&D was on its 3rd edition. I debated buying the books and trying to find players. 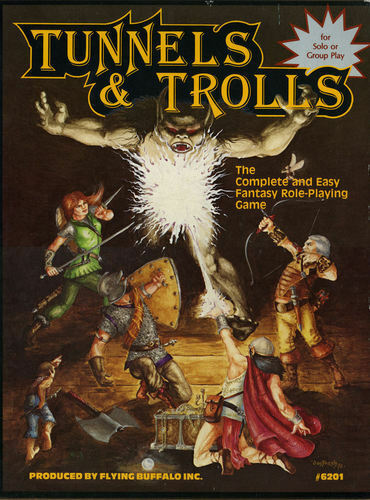 While doing research online I read about another fantasy rpg called Tunnels & Trolls. I had never heard of this game before, but it was almost as old as D&D. Also, Tunnels & Trolls could be played solitaire! I was playing Heroclix solo at the time, so playing an rpg solo was an intriguing concept. I found a website that had the basics of the T&T rules. As I read through the rules I thought, "This game is simple!" One of the issues that I had with rpgs was that I felt that complex rules were a barrier to the game. T&T took care of that problem. The game was designed to be fast and playable. You were almost forced to house rule the game immediately. The rules tell you to change them. Plus, there were a ton of solitaire adventures to keep one occupied. I felt that I had found a game that let me spend my energy on being creative instead of remembering rules. The game was so simple I began playing it with my six year old daughter. T&T brought back the wonder of role playing. This was a game I could explain to people in five minutes. If I couldn't find a group I could always play it solo. With T&T I was given permission to make things up in order to help the flow of the game. The game's up front sense of humor put me at ease. This was an rpg that was about having fun, not flipping through a rule book. Tunnels & Trolls is currently having a kickstarter for a brand new edition. If you have never checked this game out take a look. T&T is one of the most fun games I have played. Howdy Hello. I don't see a place to join your blog. Where's your Follower's gadget? I think I added it. I'm new at blogging, thanks.